On Wednesday, September 3, 2014, USA Today published an article by Jayne O’Donnel regarding the proposed rule of the Consumer Products Safety Commission (CPSC) that is as much a reflection of bad journalism as it is of government run amuck. The article is misleading and poorly edited, resulting in unsound conclusions and greatly diminished confidence in the news-outlet. The ER statistic cited in the first sentence is provably very wrong, and the there’s much more to Annaka Chaffin’s death than revealed in this article. Unfortunately, given current confidentiality restrictions a true and accurate response is not possible. The CPSC – who leaked pertinent information leading to this story – is more than aware that facts necessary to rebut certain conclusions are not available to the public at large because they are included in a protected document that is part of ongoing litigation. The CPSC doesn’t even claim 7,700, they claim 7,700 from other magnets that do not match any portion of the description of a high powered spherical magnet set. But of course the CPSC won’t mind one bit if this mis-reporting goes on to spread. It seems Jayne O’Donnel was in a rush, she didn’t have the chance to read the specifics, and just chose the largest number she could find. The number that the CPSC DOES claim is 2,900 ER injuries from 2009-2013 due to magnets that are “potentially magnet sets.” However, that too is far far FAR from accurate, since they count any magnet that is “high powered’ AND/OR “ball shaped”. When the same NEISS analysis was performed for the period 2006-2008, prior to the introduction of the “high powered magnets” there are about 2,200 injuries. In other words, the ER-visit rate per year has not changed since the introduction of these high powered magnet sets in 2009. We will be addressing the CPSC Epidemiology Department’s analysis soon, in a separate essay. For perspective: balloons, razor scooters, skateboards, trampolines, are all orders of magnitude more dangerous that magnets. Second, the death of Annaka Chaffin was tragic and preventable – but not necessarily because of magnet ingestion. There are specific facts related to Miss Chaffin’s death that should be made public to rebut the accepted cause of death, but because of a protection order in ongoing litigation, Zen Magnets LLC cannot and will not comment fully at this time. Suffice it to say that Ms. O’Donnell might have access to the relevant documents and has chosen to ignore facts set forth therein or she herself has not been given the whole story and has not chosen to seek an exemption for press access. With some effort she would be able to get the full report for press access in order to write a fair and balanced article – clearly something she is not interested in doing. It is fair to be an advocate – just don’t call yourself a reporter. Writing a piece of advocacy in the guise of reporting is misleading. Due to our current litigation with the CPSC, we have copies of the police investigation reports, and autopsy summaries. The exact details and copies of the documents are currently under a protective order and are confidential which doesn’t allow us to release them to the public. However, it is likely the press can get them under First Amendment protections as they have done in other cases where there are protected confidential documents. 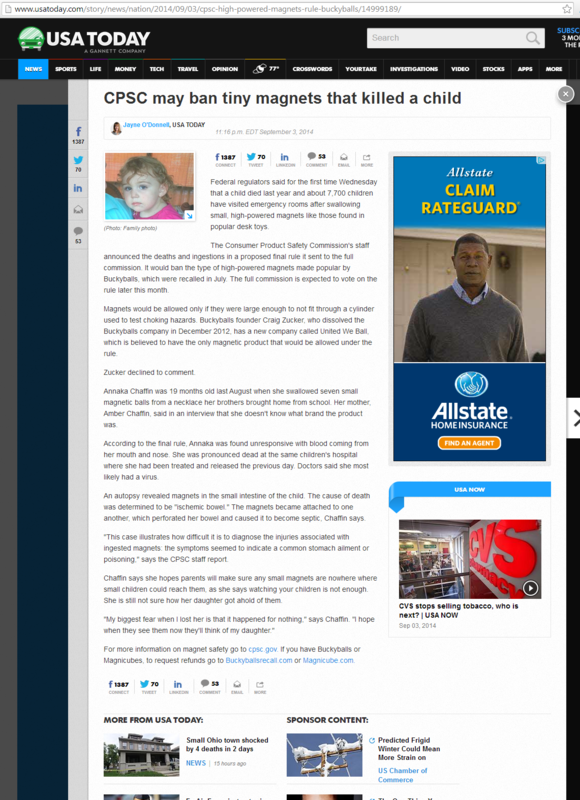 It’s unfortunate that we need to focus on the tragic death of a child, but the CPSC is exploiting her death in an unfair effort to stifle commerce and liberty. As such, we will have to work through the legal processes to reveal these documents so the American public to expose this yellow journalism for what it is. Federal Target, No History of Injury.